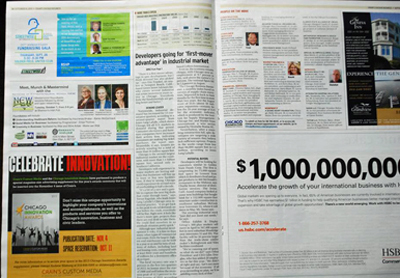 Crain’s Chicago Business is hosting Small Business Week from September 30 through October 4, and NEW-The Network of Entrepreneurial Women is excited to participate and to be featured in the magazine! 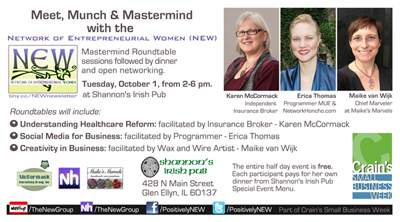 We will host Meet, Munch & Mastermind, an afternoon of roundtable discussions, in Glen Ellyn on Tuesday, October 1 from 2 to 6 p.m. Participants will attend 30-minute sessions of discussions on Healthcare Reform, Social Media for Business and Creativity in Business. After each session, you’ll have the opportunity to rotate on to a new table with a different group of fellow participants to enjoy another lively, enlightening discussion. Each session will provide opportunities for brainstorming personal concerns/questions related to the topic discussed. Shannon’s Irish Pub, 428 N Main St, Glen Ellyn, where we had a delicious lunch at our initial Glen Ellyn outing, is hosting our group, and we’ll of course follow the business masterminding with a networking dinner.
. RSVP at MeetUp or via Facebook. Learn more about previous Network of Entrepreneurial Women events.